Make your own decorative pillow. 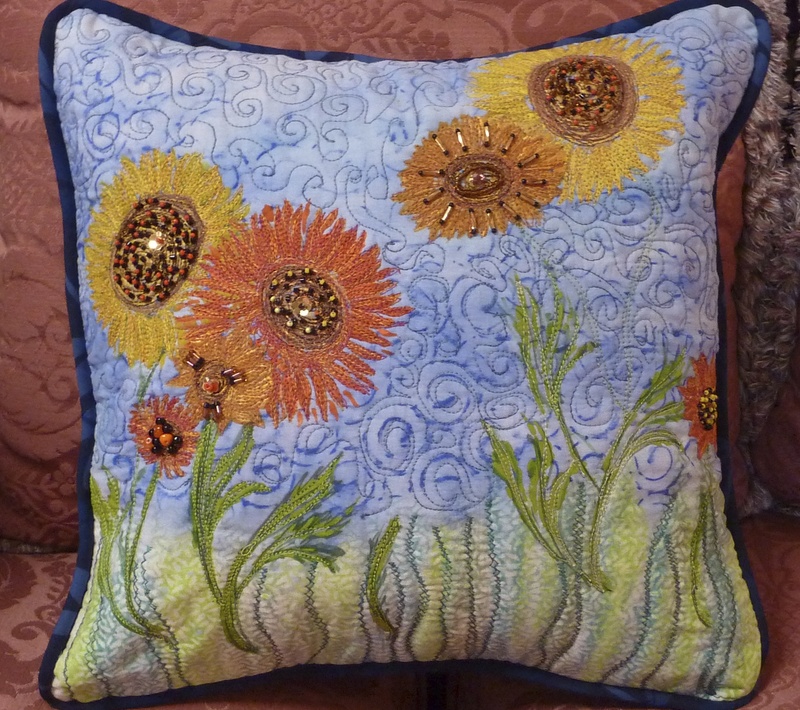 You will paint your own fabric and embellish it with stitching and beads. Over the course of the six class meetings you will learn the skills to: select your fabrics, follow a quilt making pattern, use a rotary cutter safely to cut quilt pieces, piece your quilt blocks and quilt so it all comes out right!, prepare and add quilt borders, layer and quilt the 3 quilt layers together, make and add quilt binding. This cover fits a composition book approximately 9 inches high by 7 1/2inches wide. Above is the size we will be making in class. 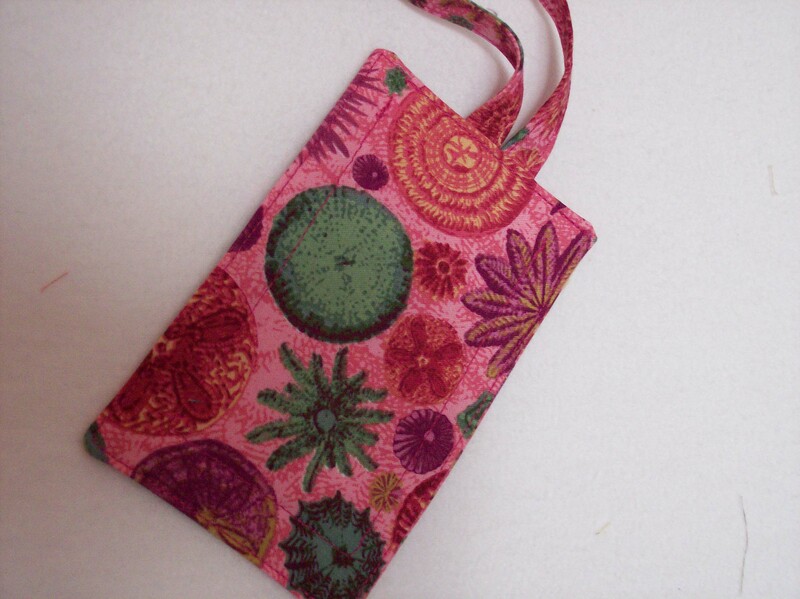 We will provide the composition books in the purchased supply kit.The cover below was adapted to fit a spiral bound art journal measuring approximately 5 1/2 inches by 8 inches. We will provide guidelines for adapting directions for other sizes. A veritable smorgasbord of techniques to fire up your imagination and your fabric! We will be painting with acrylics – stencilling, stamping, using paintsticks with rubbing plates, discharging fabric – you name it! 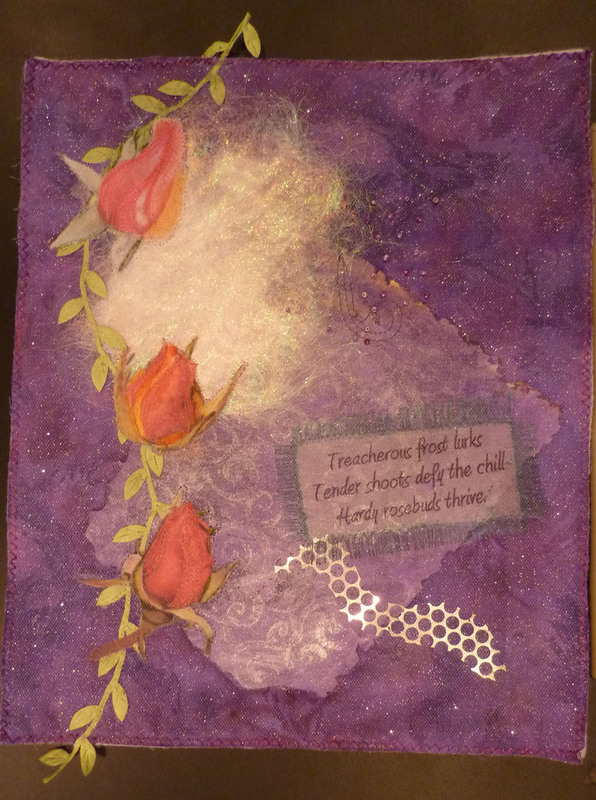 You will also learn how to apply some glitz to your work with angelina fibers, foil and glitter. Learn how to transform fabric with paint. 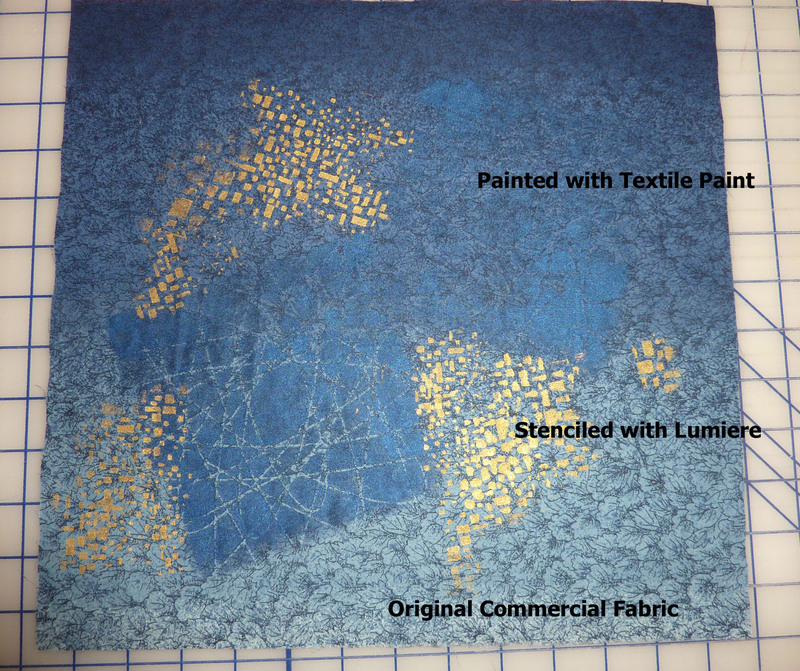 You will learn to stencil and stamp with fabric and paint to achieve the look you want. 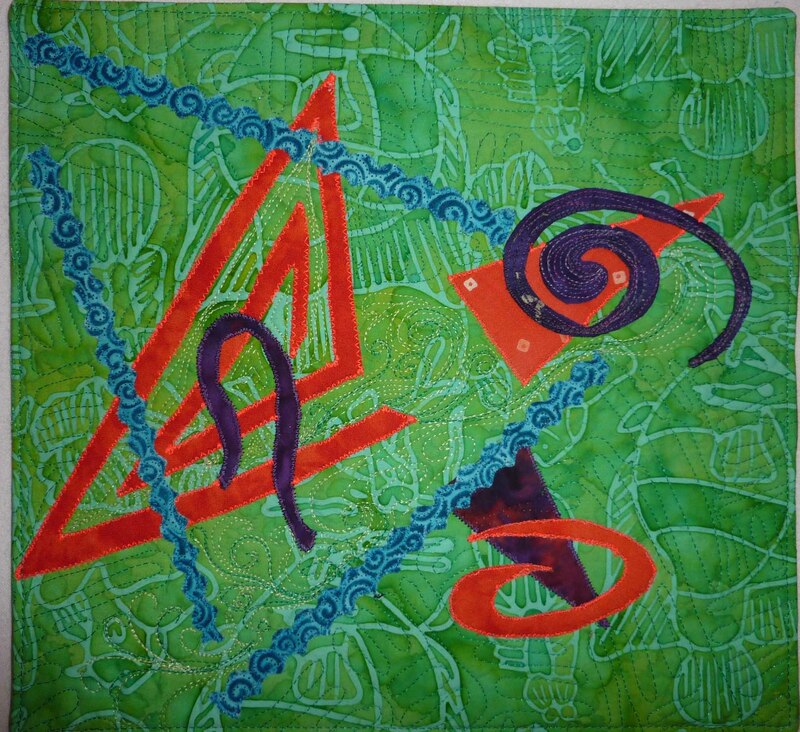 Take your surface design to the next level with fabric discharge, paint sticks and rubbings. Weather and sunlight permitting we will add sun printing. 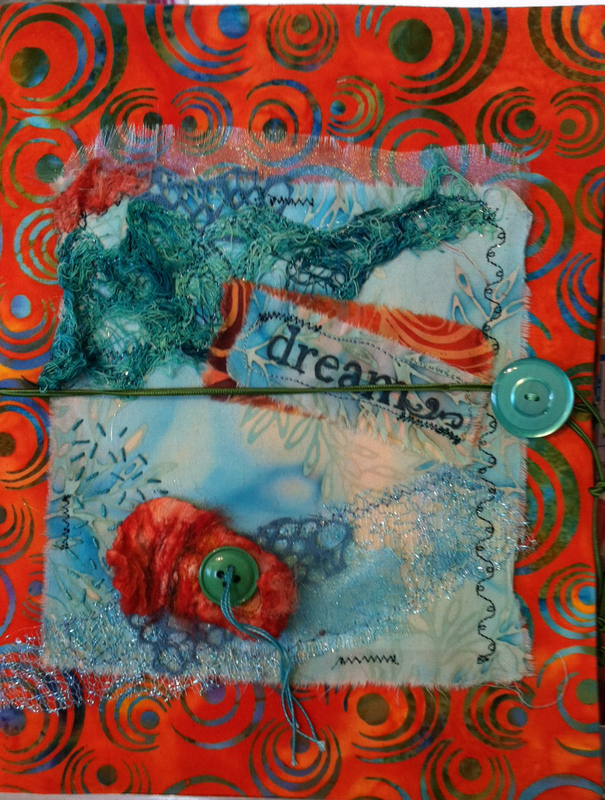 Bring on the Bling and learn how to use Angelina Fibers, Foils, Glitter and Crystals in your art quilts. Get into your right brain while you create. 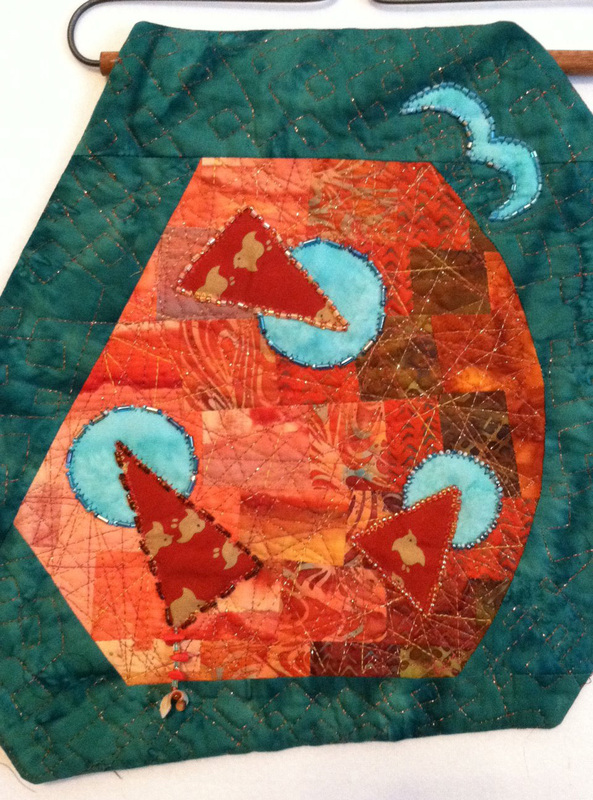 Assemble a freestyle quiltlet using fused scraps and an off beat shape. 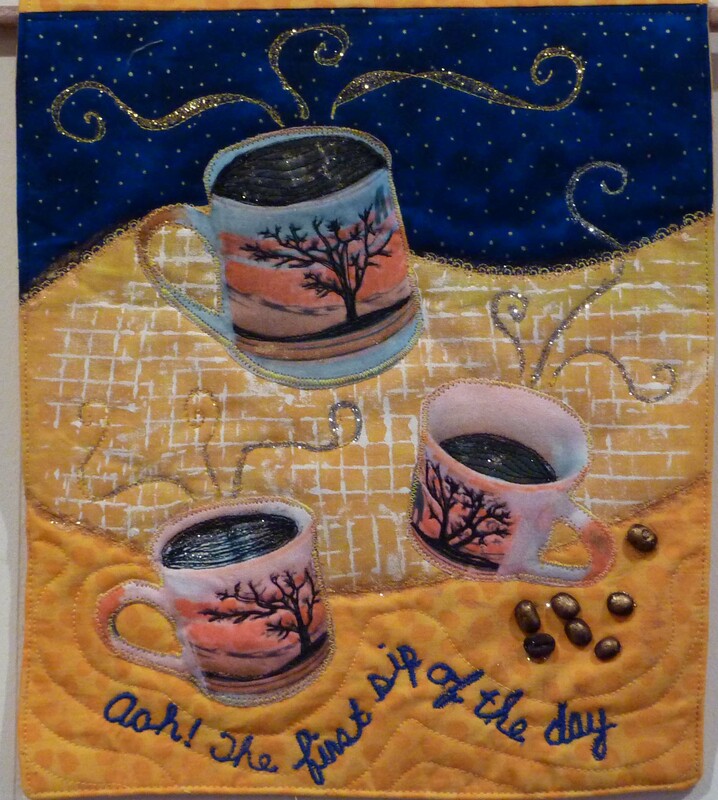 You will complete the quilt top during the first 3 hour session. 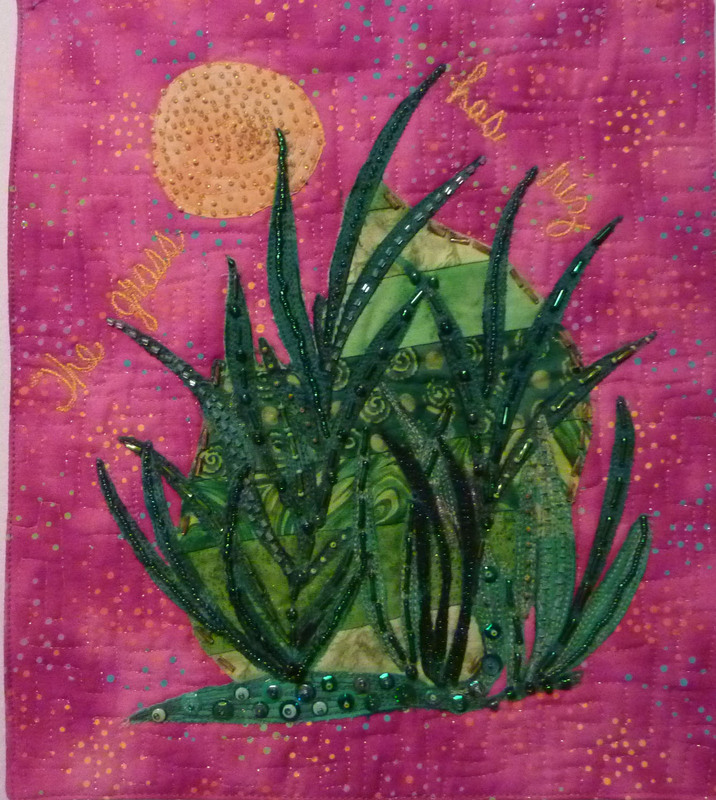 Add free motion quilting and embellishment including use of decorative threads, beads, charms and buttons during session number two. 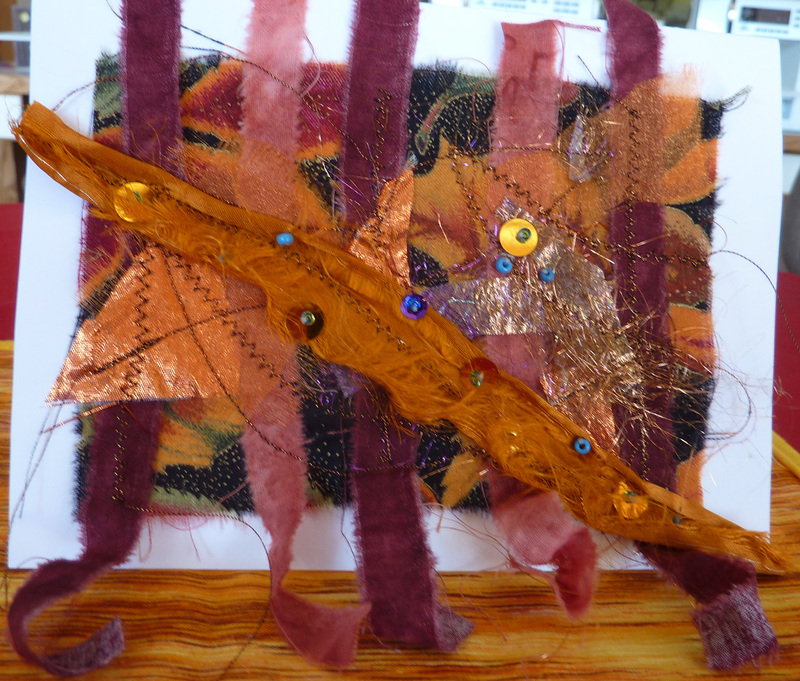 Unleash your creativity while you create a fabric art card that is a piece of art as well as a greeting. Perfect for gifting or framing! 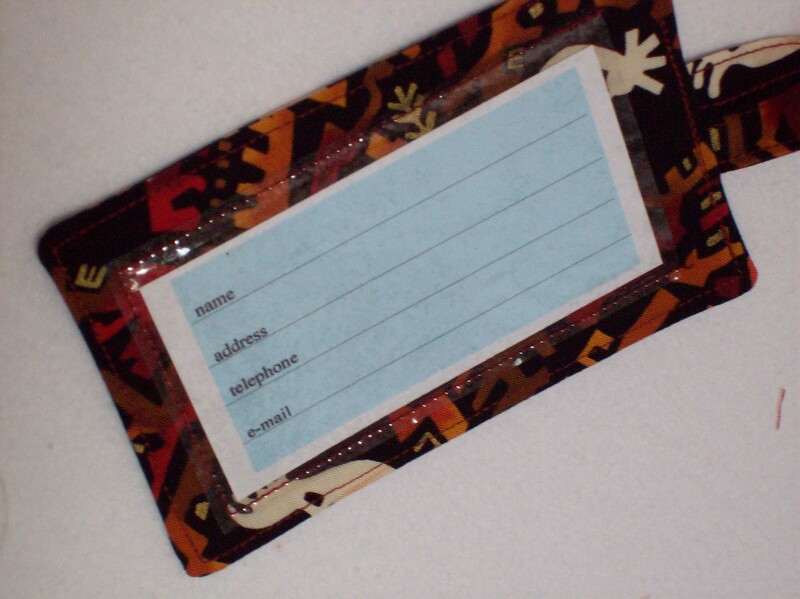 Make a decorative and functional I.D. tag for your luggage, your sewing supplies, for gifting – you’ll want them on everything! Do you have a leftover block or an embroidered “stitch out” that has been sitting on the bottom of the pile but is much too cute to toss? 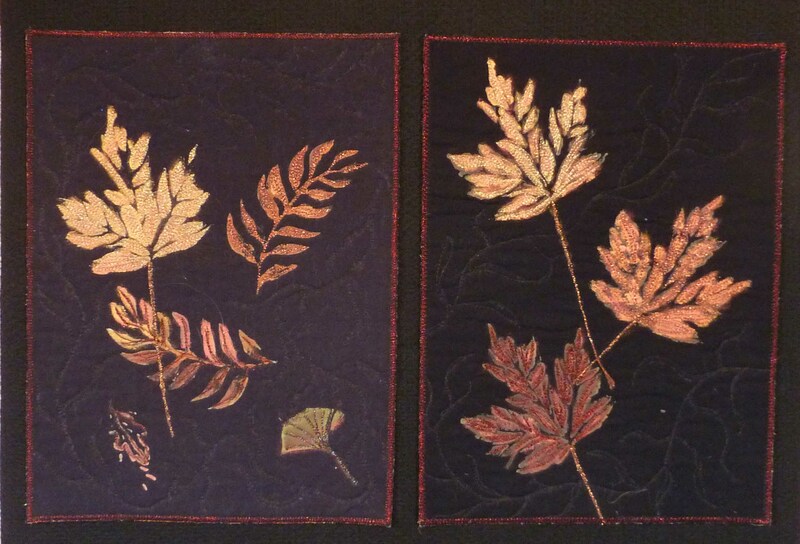 Come and learn how to build an art quilt with them. Add drama and texture with lutradur, cheesecloth, tyvek, tea bags, softener sheets and much much more! Fabric available to us is almost endless in its variety, color and design. But once you enter the world of Art Quilting you will find that you’ll want to create your own fabric in order to get just the look you want. Sometimes it’s just a matter of adding some design elements to the commercial print; other times you may want to start with a blank canvas. Plus it’s just plain FUN !! In this workshop you will learn how to select and prepare fabric for painting; the characteristics of available fabric paints and how to select the appropriate one for your project. 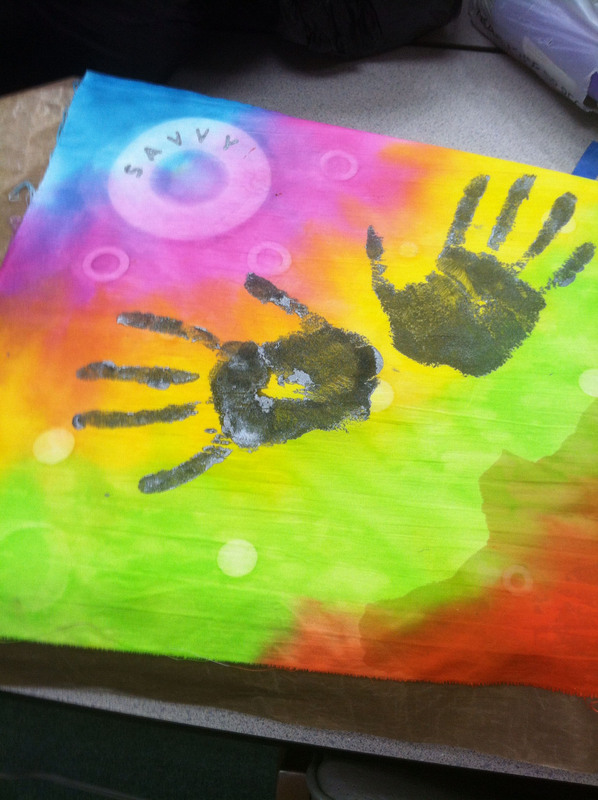 You will learn how to apply paint using stencils, stamps and resists. 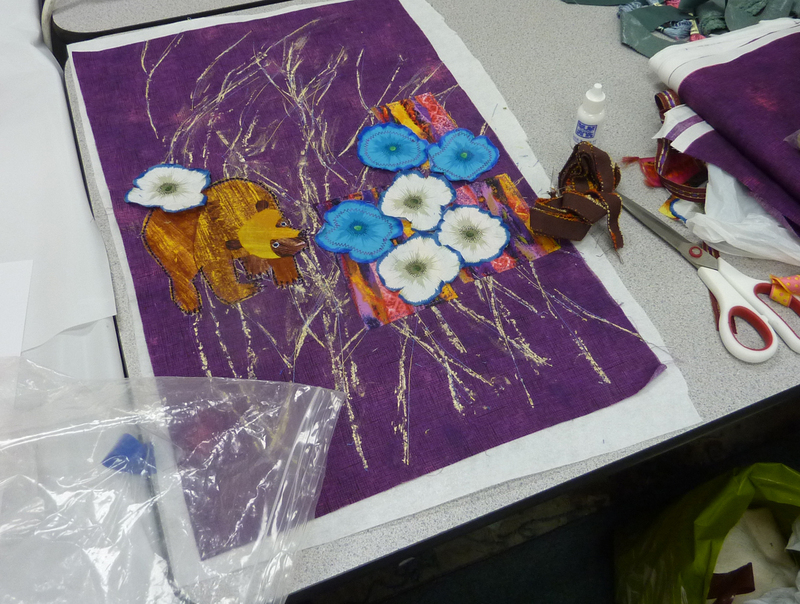 no sewing machine is needed for this class. 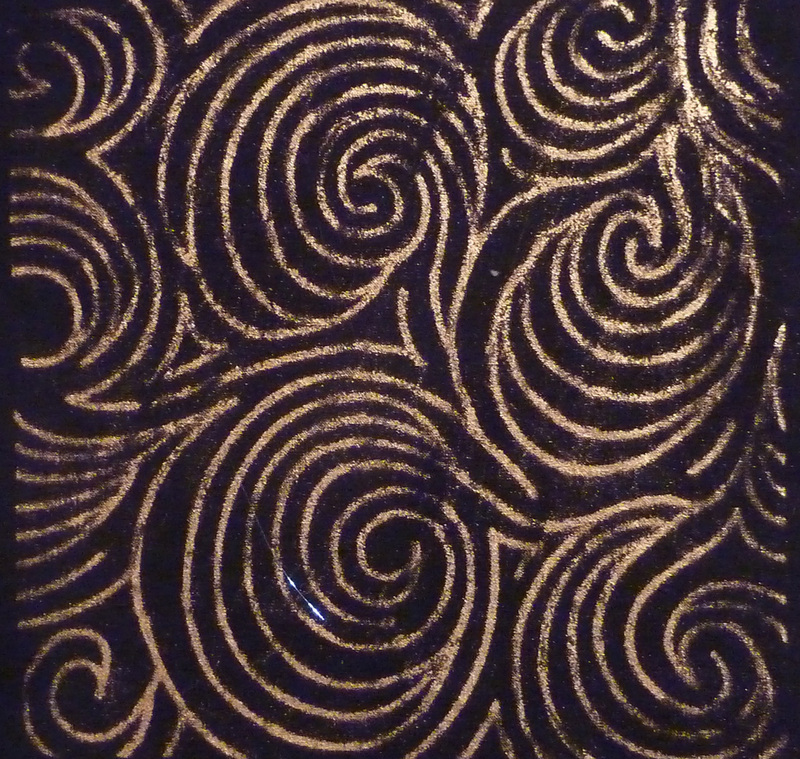 Make your unique fabric creation even more special with discharge techniques and paint rubbings. You will learn various techniques for removing dyes from your fabric to achieve your original design. Once you have selectively removed the color, the possibilities are almost endless. You will also learn how to apply oil based paint sticks to fabric using commercial rubbing plates as well as “found objects”. Punch up the excitement and the sparkle. 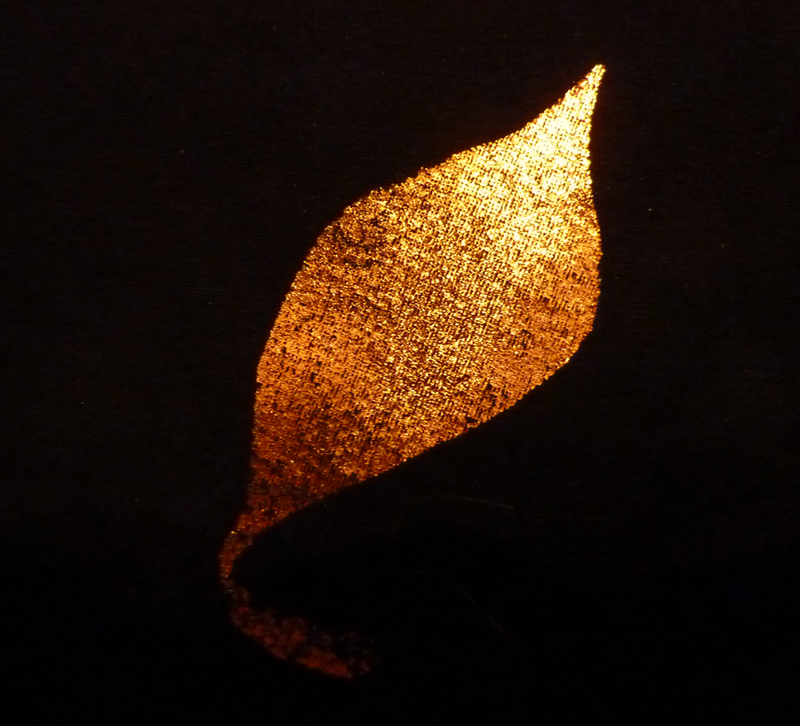 Learn how to use Angelina fibers, add metallic foil and glitter to your creation. Bring on the Bling, add crystals with ease. 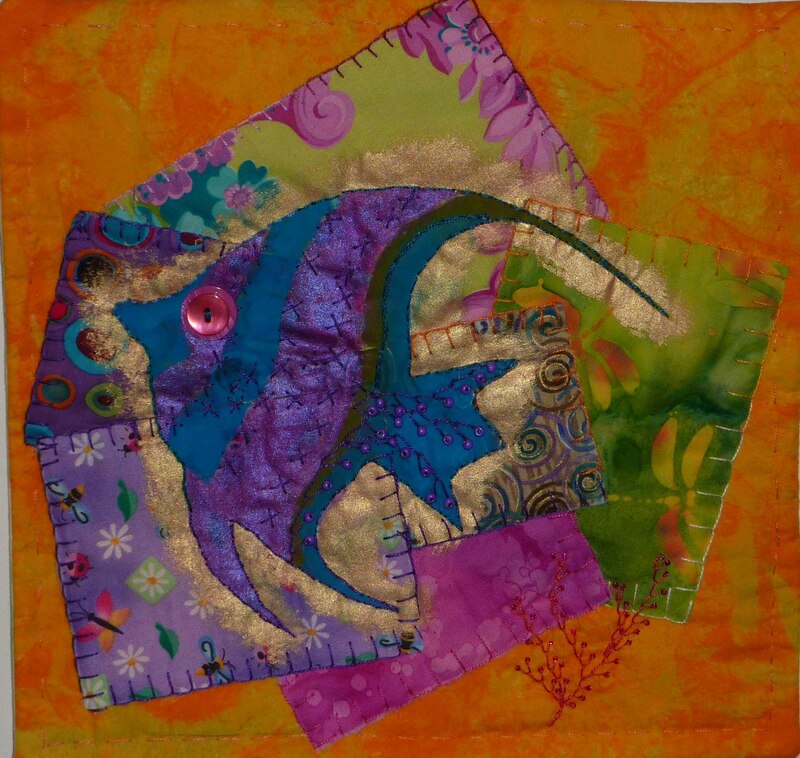 During this class you will learn how to add dimension and interest to your art quilt with fused and raw edged applique. 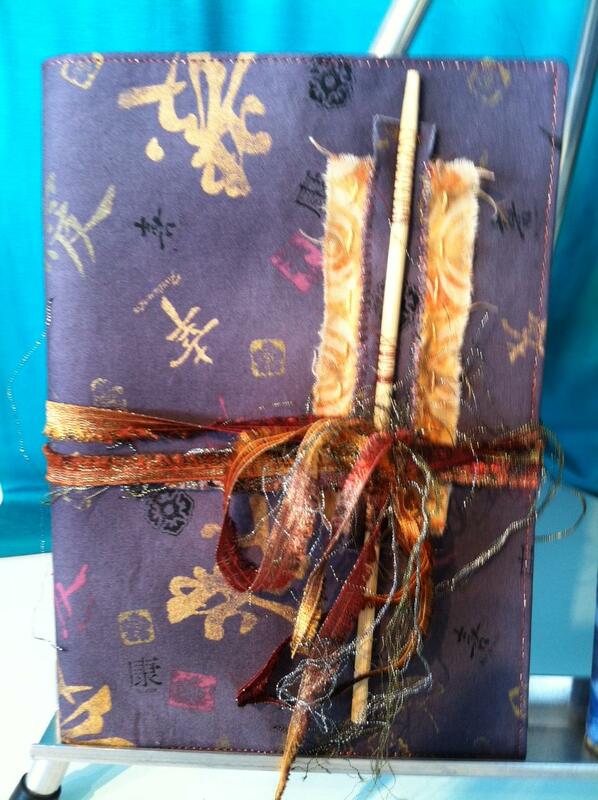 In addition you will have fun playing with some scrumptious fibers and using them to further enhance your art. * Sewing machine is required for this class. This is a 6 hour class held in 2 sessions of 3 hours each. 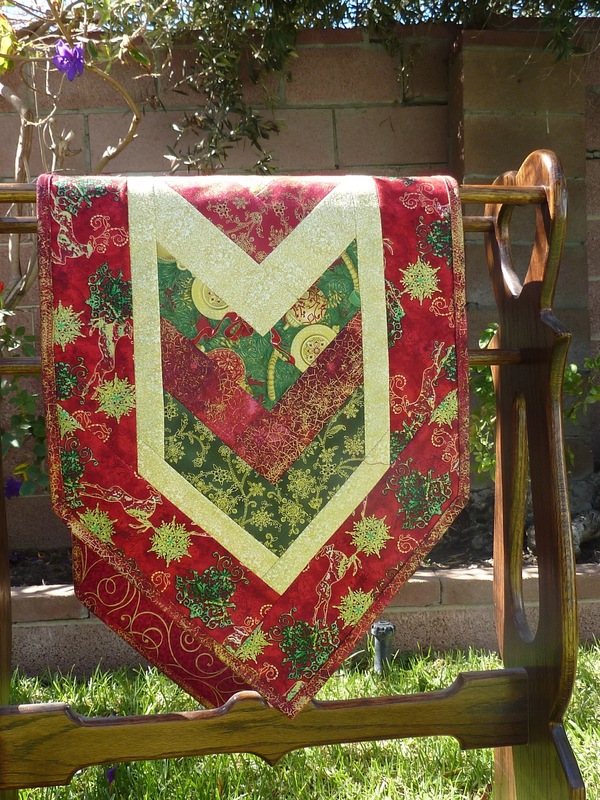 You will learn how to select batting and backing for your piece and how to prepare it to be quilted. We will also discuss choice of thread (including bobbin thread) for quilting and how to plan the quilting itself. 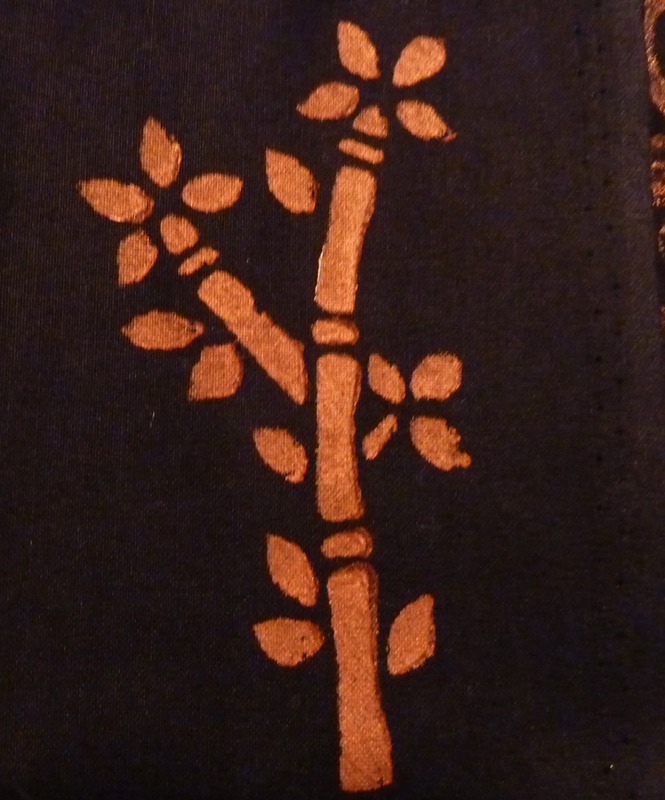 If you choose to assemble a wall hanging you will learn how to finish the edges of your piece with a choice of binding techniques or other finishing methods. You will also learn various ways of preparing your art piece for hanging. If you choose to assemble a pillow you will learn how to put together a removable pillow case using a 2 piece lapped back. * Sewing machine required for this 2 part class. Boost your creativity by learning new ways of applying decorative elements to fabric by using stencils and rubber stamps. These versatile tools lend themselves well to beautifying your backgrounds and more! Beading adds drama, texture and sparkle to your fabric piece. 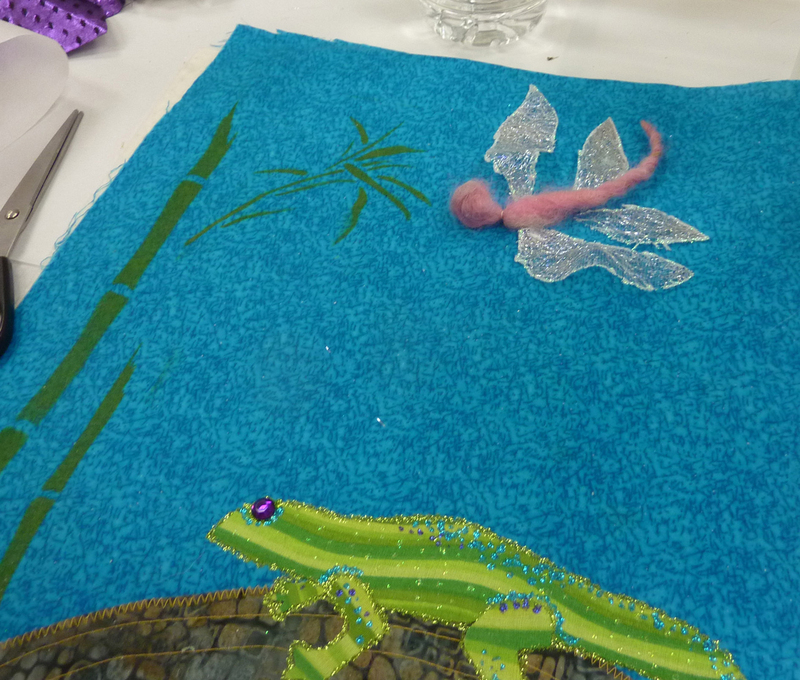 Learn how to select and apply beads with various beading stitches to achieve the effect that you want. 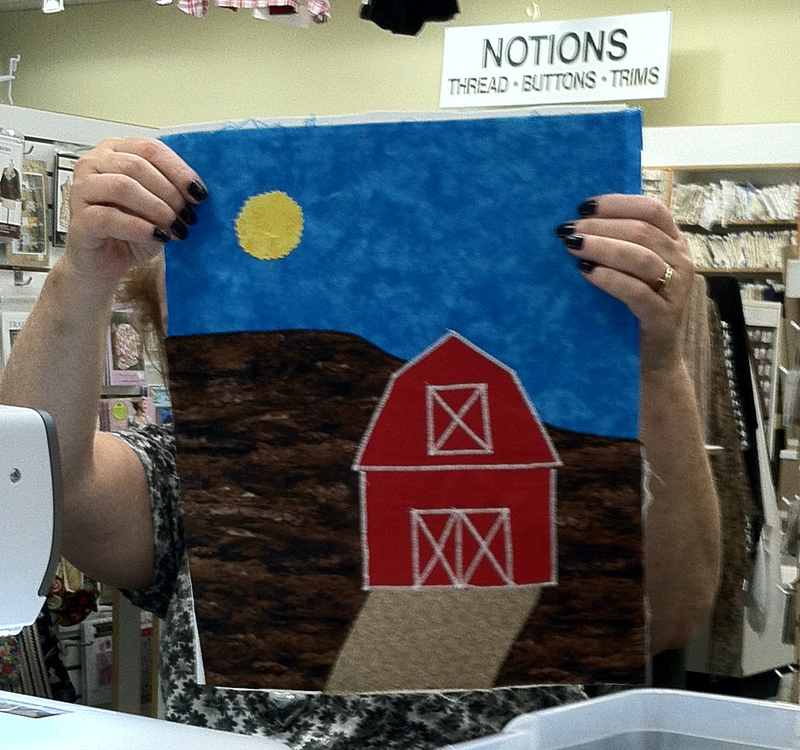 no sewing machine is required for this class. 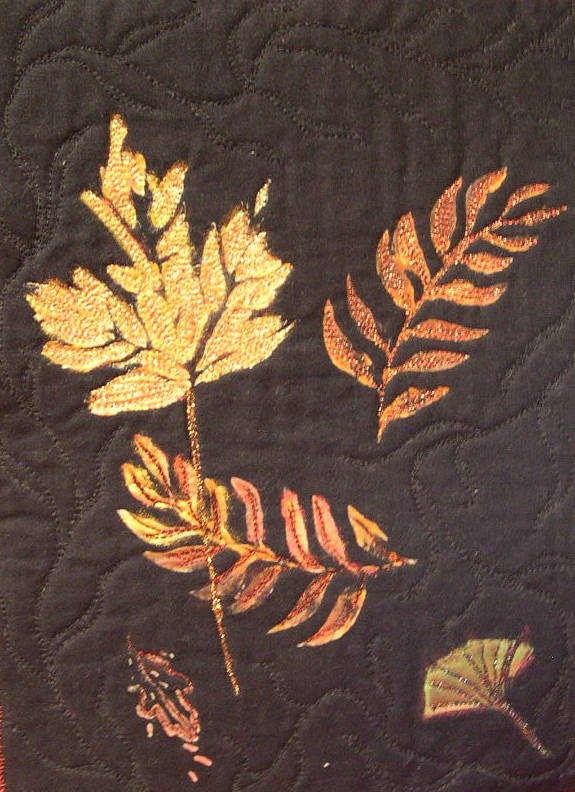 Learn how to select and apply a broad range of threads to your quilt surface. 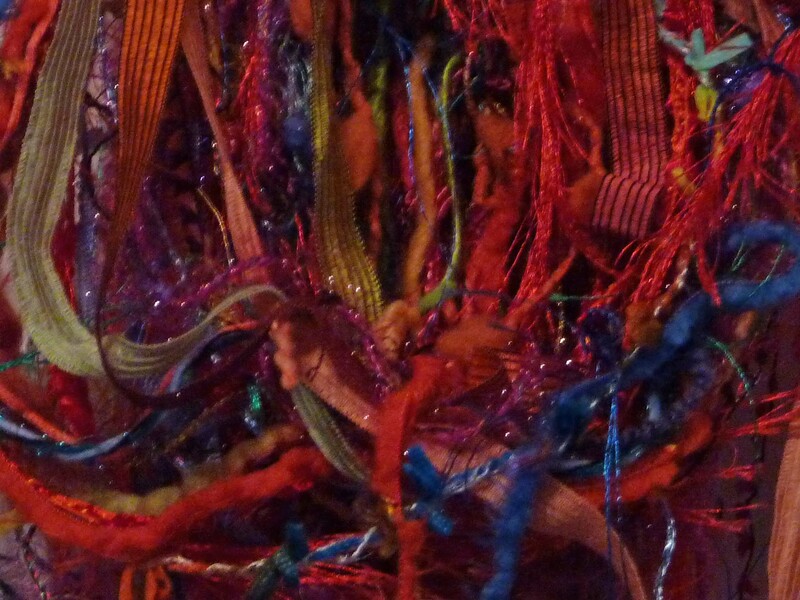 Topics will include bobbin work and stabilizing/hooping your fabric. Get into your right brain while you create. 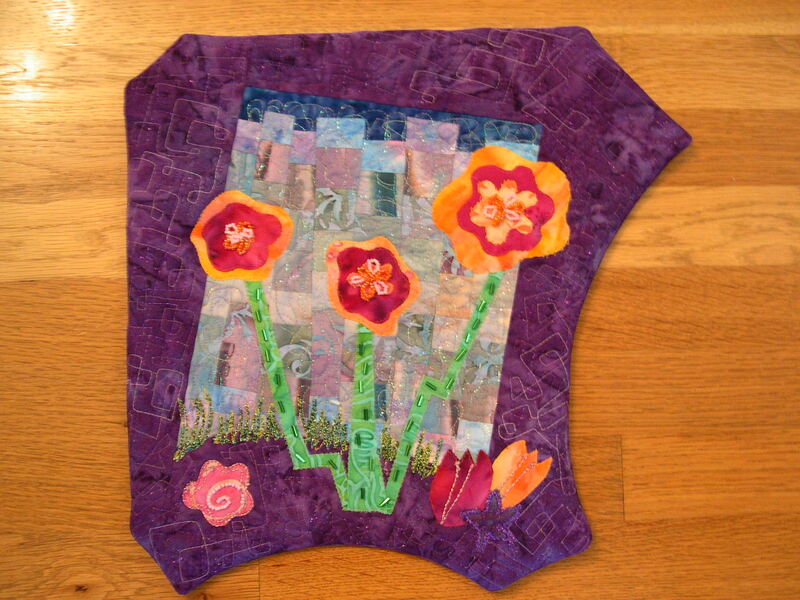 Assemble a free style quiltlet using fused and/or pieced scraps and an off beat shape. No patterns. No templates. No blueprints. 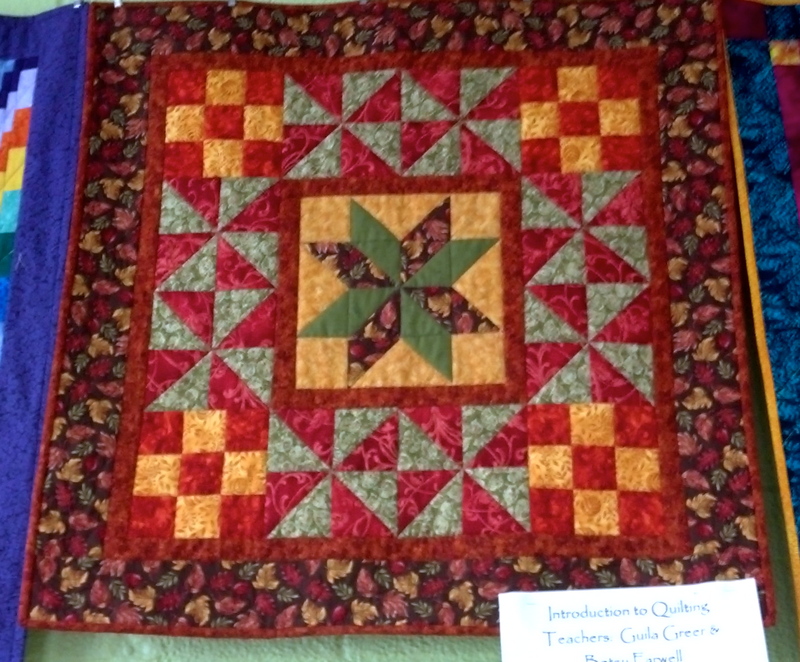 Your quilt will tell you what to do as you go along as you embellish, quilt and finish it. And stay tuned for Sunday “make it – take it” sessions at Barons planned for November 25, December 2 and December 9. You’ll have a chance to stop by and make a quick Holiday gift – more info to come from Baron’s.